Hey, it's a new week, so I guess it's time for another race report. It was one hour and thirteen minutes faster than my 50k last week. I finished 137th out of 138 finishers. I went into the race with a plan and with some doubts. I had no idea how I would respond to another 50k one week after this one. I'm told this doesn't correspond to normal rest and recovery timeframes. However, I had not finished this race in two previous tries. Once was due to youth coaching commitments and last year was due to...well...giving up. To be perfectly honest the course is not my favorite, but I had no intention of letting this go unfinished. So I had signed up for these two races back to back and now it was time to close the deal. My plan was to run the first two laps fairly rapidly and bank some time so that if and when the wheels came off on the second two laps I would still have time to make the eight hour cutoff. Last year I had gotten to the final lap with less than two hours to go and gave in to the idea that I couldn't make it. I wanted to finish the first two laps in 3:30 and that would give me time to trudge in the last two laps if necessary. The doubts came from a number of things. My feet were still in pretty bad shape from the extensive blisters I had from Cheyenne. I also knew my legs were still feeling pretty lethargic after the long effort on the previous Saturday. I had gotten a couple of runs in but I was pretty far from Downy "fresh". I also knew it might get warm which could exacerbate the normal puking issues. The pre-race machinations were highlighted by a great visit with Mr. and Mrs. Happy Trails. They are just some wonderful folks and it is always great to talk with them. Mr. HT had some great training going into the race and I can't wait to see Mrs. HT get back to her blazing fast ways (next year's Greenland?) Mr. HT finished the 25k in 2:00:48! Unbelievable. I just asked him not to pass me twice on the first lap and thankfully he didn't. So, I ran the first lap. I spent a big portion of the first lap talking to a runner I've talked to previously at Cheyenne and Greenland, a guy I call Firefighter Chuck. (He works for CSFD). We have a similar pace and he is fun to talk to about ultras and races and the local running scene. I don't normally go in for the socializing but in this case it made the first part of the race go very quickly. Chuck and I would wind up going back and forth several times during the race. The first lap was 1:39, a perfect time for me. I felt good, I was moving at a slow, but easy pace and I was trying to set myself up for a consistent finish. I also tried Injini socks. I needed something to try and stave off blisters and my good friend and fellow Leadville conspirator has been recommending them for some time. These are the socks with built in toes. Let me just say, they. were. awesome. I'm really sorry I waited so long to try them. My feet were pretty horrendous going into the race with barely any skin on several toes, but I didn't have a hot spot one time during the whole race. The other big change I made was to hit S-Caps instead of Endurolytes or just food. This is another item that the co-conspirator and Mr. HT have pushed on several occasions but I just never got around to it. Today I was hitting them every 45-60 minutes. On the first lap, I did not puke. The second lap came in at 1:46. I was pushing into this one, trying to make sure I was banking the time I would need to finish. For me this was a perfect time. I had planned to finish the first half in 3:30 and left the aid station at 3:27. This was really encouraging. I also saw the fam' and the extended clan; what an encouragement they are! It felt nice running by and actually feeling like I wasn't yet totally defeated. Also, on the second lap, I did not puke. The third lap was the tough one. I hit a really tough patch where I ran out of water (pack didn't get filled up all the way at the aid station) and my knee started having some shooting pains. I knew it was just a little pre-tendonitis that comes on occasionally but it was very discouraging. The hurricane-like winds that normally come out on the Greenland open space also picked up. It makes you feel like you're running into a wind tunnel. Despite the amount of time I had to finish I just felt mentally defeated. Almost every step up or downhill was painful and I slowed to a crawl. If the turn around had been at that point, the outcome might have been different. However it wasn't and in the time remaining I hit another gel, popped another salt pill and started "running" (aka waddling) again. I mentally regrouped and reverted back to my mantra from Cheyenne. Whatever it takes. I decided that I hadn't gone out there in the 80+ degree weather for five and a half hours just to quit. I hadn't bombed those downhills and banked all that time just to give up. I hadn't doused myself in endless gallons of sunscreen just to work on my tan. I was going to start the fourth lap. I saw Chuck moving on the fourth lap as I was finishing the third and he asked me if I was going to do it. My response? Whatever it takes. 2:05 for the third lap. Additionally, on the third lap, I did not puke. Then, I started the fourth lap. There really is no way to describe starting the fourth lap. Starting the fourth lap is a beautiful thing. It means that even if I don't make the time I am going to cover the distance. It means I pushed through all the obstacles and made it to the final stage. It means that I did not quit. It means that I was FINALLY going to finish the race. Starting the fourth lap is magic. I will also say that the Aid Station dude who supplied me a bunch of ice was clutch. The fourth lap went quickly. I was feeling better and getting faster as I went along. I felt like I could have gone ten more miles. To be honest it was a bit emotional. I had really beat myself up after pulling out last year, and it was hard to take. I think I must have envisioned crossing the finish line and getting that medal about a dozen different times just during the last lap. When I finally crossed the line, I had the biggest smile on my face. I had finally conquered this bugger. 2:15 final lap. 7:42 overall. And I even didn't finish DFL. (Yeah I was set for it, up to the last mile when I passed someone.) AND, I didn't puke. Not once during the entire race. In nine ultra attempts, that has never happened before. It was a beautiful day. After managing to change into my race shirt, put on my medal, and drive home, I walked in the front door and was met by cry of glee and an enormous hug from the most beautiful woman in the world and my best friend. It was a great ending to a great day. 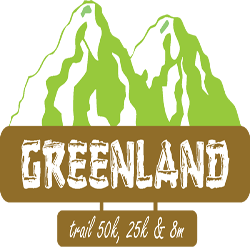 Top Ten things I learned from finishing the 2012 Greenland 50k. 10. Chafing in the nether regions = not much fun. 8. Recovery time between races is overrated. 7. Not having to stop and heave saves a lot of time. 6. I have several bottles of Endurolytes that have recently become available, any takers? 5. S-Caps are quite lovely. 4. I love Injini socks. 3. My family loves me whether I finish ultras or not. 2. My wife loves me whether I finish ultras or not. 1. My God loves me whether I finish ultras or not.